It’s been quite a week, with new owls in five states — but there’s lots happening with the rest of this winter’s cadre, too. Here’s a roundup of where we stand with all 24 of the snowy owls we’re currently tracking. It’s a lot of ground — geographically and metaphorically — to cover. The most intriguing movements this week were Sinepuxent’s. Last weekend we noted that this juvenile female, tagged Jan. 28 on Assateague Island, had flown north into southern Delaware after dusk on Feb. 9 after being pushed around the barrier island almost constantly by photographers, birders, vehicles and beachwalkers. Well, she didn’t stop. Over the next six days she flew more than 240 miles (380 km) northwest across Delaware and eastern Pennsylvania, moving steadily every night, eventually crossing the Susquehanna River to southern Clinton County, then reversing and hooking back south to farmland west of Lewisburg, Union County, PA. That was probably a smart move, since the point at which she turned around was the southern margin of what’s known as the Pennsylvania Wilds, the heavily forested Allegheny Plateau where deer, bear and elk are common, but snowy owl habitat is in short supply. Will Sinepuxent stay in the central Pennsylvania farmland, or keep moving? We’ve had coastal owls make long-distance movements into the interior in the past, only to return to the coast — Hungerford did much the same in 2014. Or she may push through the woods to the Great Lakes beyond. We’ll be watching (and so can you, by checking her map for updates). The biggest surprise last week, though, was the reappearance of an owl we haven’t seen in two years — Brunswick, originally tagged in January 2016 in Maine, and last heard from in April of that year when she was heading north on the Gaspé Peninsula in Quebec. She didn’t come south into cell range last winter, but last week her transmitter checked in from Sandy Beach on Cap-Pelé, along the coast of New Brunswick. Although she sent no data in this transmission, her unit did take up the battery-saving software configuration, which should help it regain voltage more quickly. We are incredibly anxious to see where she’s been the past two years. 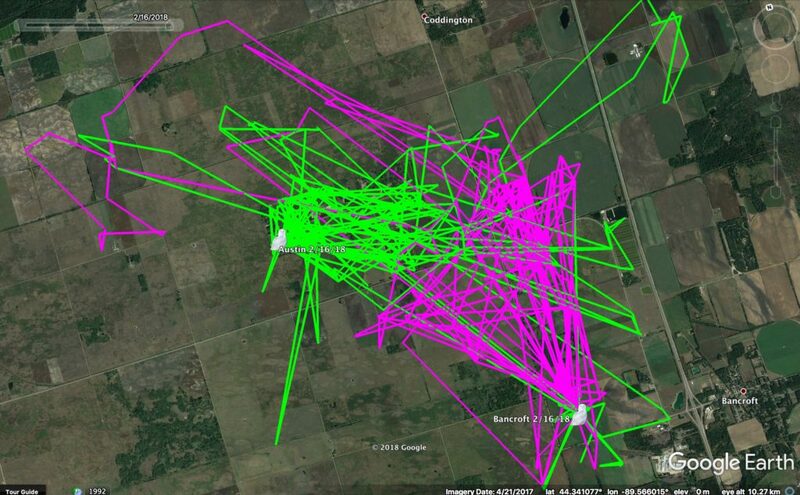 Sticking with returning owls, Chickatawbut remains on her winter territory near Louiseville, QC, along the northern shore of the St. Lawrence, and Hardscrabble remains near Arnprior, ON, west of Ottawa. We were also able to confirm that a nearly pure-white male wintering just up the road from Hardscrabble is, in fact, our old friend Baltimore, whose transmitter failed last winter and who evaded multiple attempts then to recapture him. More about this guy, whom we first banded in 2014 and have been tracking since 2015, in the near future. Wells remains AWOL, last heard from along a busy highway in Quebec City. Fearing the worst, we asked local friends to check that location earlier this month, but they found no sign of her — although if she had been struck by a car, she could be buried under the enormous piles of snow along the road. Time will tell. In New England, newly tagged Manisses has been staying around Trims Pond on Block Island, but Logan took off from her relocation site on Cape Cod and flew right back up the Massachusetts coast to Logan Airport — though fortunately she left the airfield again quickly, and Friday evening was along Revere Beach, about five miles north of Boston. On the mid-Atlantic coast, Island Beach was on the northeast shore of Delaware Bay in New Jersey’s Dennis Creek Wildlife Management Area, while Lenape — who has spent the whole winter moving between the northern New Jersey coast and the Eastern Shore of Virginia — was back south on Assateague Island in Maryland again. 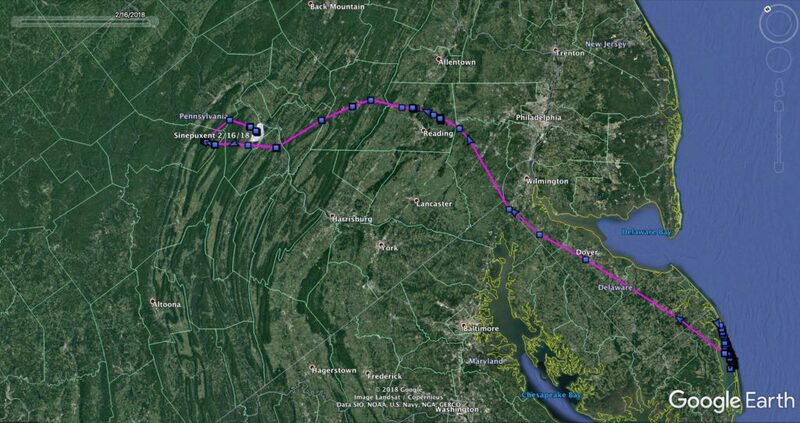 Hereford, our newest New Jersey owl, was close to his tagging site near Stone Harbor, NJ. No changes on Amherst Island for Stella and Emerald, who have been regular as clockwork on their territories since they were tagged last month. No news since our last update on Hilton and Sterling, either of which may be well out on Lake Erie (Hilton) and Lake Michigan (Sterling). In the Upper Peninsula of Michigan, Pickford continues to use one of the more restricted territories we’ve seen this winter, while nearby, Pennington is developing a bimodal pattern, shifting a couple of miles between two long, narrow hunting areas southwest and northeast of the town of Pickford. 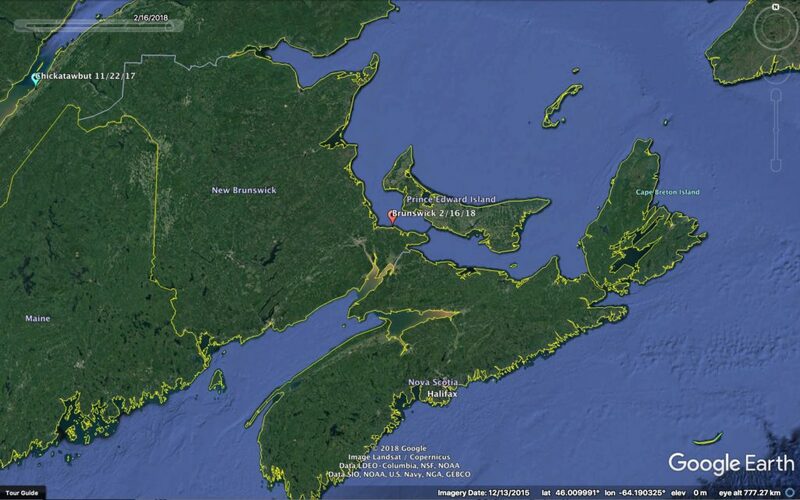 Nothing since Feb. 12 from Gichigami, who is out on the ice of Lake Superior. Status quo in Wisconsin for Badger, Austin and Bancroft; the latter two continue to weave their movements around each other in fascinating and instructive ways, sharing the landscape while staying out of each other’s way. Arlington took a little walkabout Feb. 12-13, making a 90-mile (144 km) jaunt east to the outskirts of Watertown, south to Lake Koshkonong, and then back up to his normal territory. As with Sinepuxent’s big flight, this may be the lengthening days beginning to make the owls a little restless, and we should see more exploratory flights like this in the weeks ahead. Finally, we had an update from Pettibone in North Dakota, who is close to his tagging point, but not Ashtabula, who as you’ll recall is in an area with spotty cell coverage. Whew! This is the largest number of owls we’ve ever tracked in the same winter, and we hope it’s as exciting for you as it is for us. It is May 15, 2018 and there is a Snowy Owl in Loganville, WI.